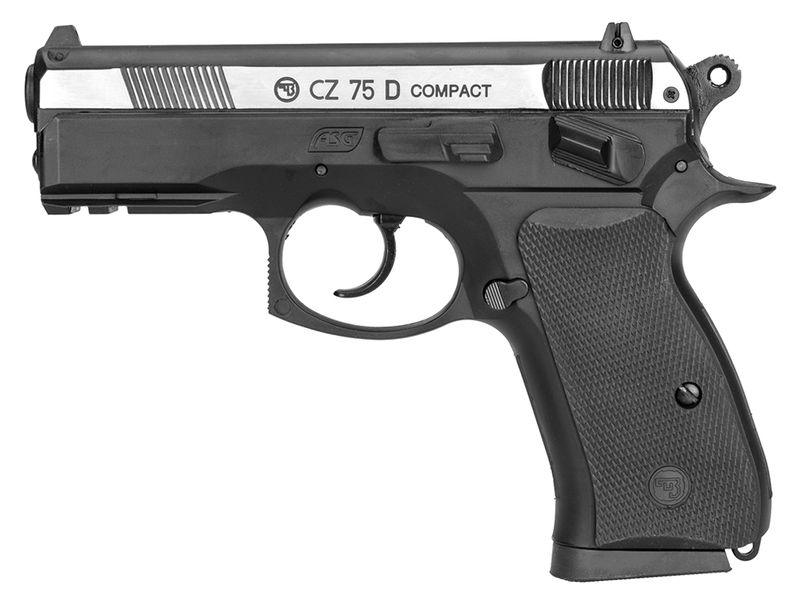 Trigger Pull: The trigger pull on the ASG CZ 75D Compact is fairly light in single action as all the cocking has already been done. When shooting in double action mode, the pull is still fairly light but has a point right before the break where it stiffens up for a moment - not too noticeable when shooting quickly but you may find it more noticeable when shooting slow in double action. Accuracy: I did do my pre-shooting test and fired off some shots through the ASG CZ 75D Compact airgun at a target from 20 feet away in a semi-rested position. It performed well getting a 1-inch group with a few stragglers stretching it out to just less than 2 inches fairly well centered on the target. The sights are adjustable for windage in the back so this could be corrected if the gun out of the box is not shooting exactly down the center. My Chrony testing with a five shots resulted in fps ranging from 380 right to almost 400. Build Quality: ASG usually only distributes high quality guns and the fit and finish is as nice on the ASG CZ 75D Compact as any other ASG product. The slide wiggle is virtually nonexistent; one of the best I have seen thus far. I would have liked to have seen a metal slide on this one but even so the gun has decent weight and balance to it coming in at 4 pounds in a compact pistol. There is metal where it really matters like in the trigger, hammer, safety, magazine release and of course many internal parts. 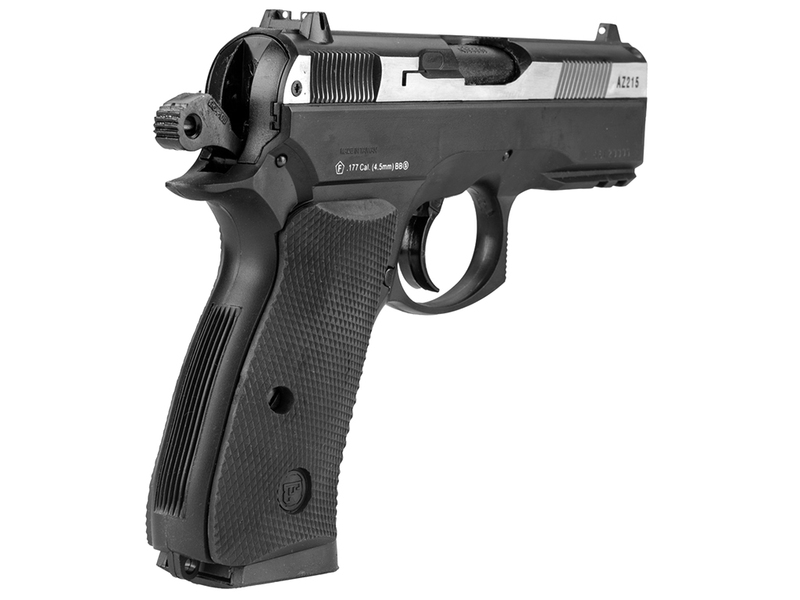 Realism: The ASG CZ 75D Compact is very accurate replica of the real steel version, with full licensed CZ trademarks and even the 9x19 caliber markings in the slide ejection port area. The magazine is full metal and full size and does not have any telltale CO2 tab sticking out or elongated area hiding it. Again the metal slide would have finished it off. Overall very good replica, fully licensed. Well made, fit and finish is very good (slide has zero wobble). Good combination of power, accuracy and shots per CO2. Adjustable rear white dot sight. Full size drop out Metal magazine adds weight to it. Single and double action hammer trigger. Accessory rail for add ons. No Blowback action but does have a working slide. Plastic slide, would have better balance and feel with a metal slide. Slide catch does not work, moulded in. CO2 is a bit hard to install - be careful! Comments: I am a bit of a blowback guy so I generally don't look forward as much to reviews of guns without blowback. It was however nice that the ASG CZ 75D Compact does have a moveable slide and it has the least amount of wobble out of any gun I have reviewed to date. 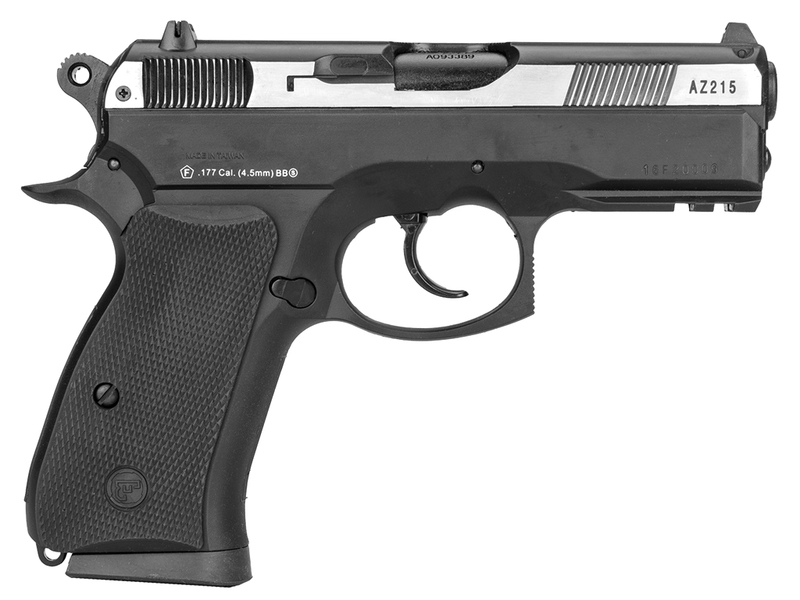 I was impressed with the overall performance of this air pistol and nothing stands out. Overall it is a nice complete package getting lots of shots per CO2, good fps, good accuracy, a single and double action trigger, adjustable sights, a rail for add-ons, a full size drop out metal magazine and it's a really good overall replica with full CZ licensing throughout. Not bad for a fairly low cost 45.mm CO2 BB pistol! 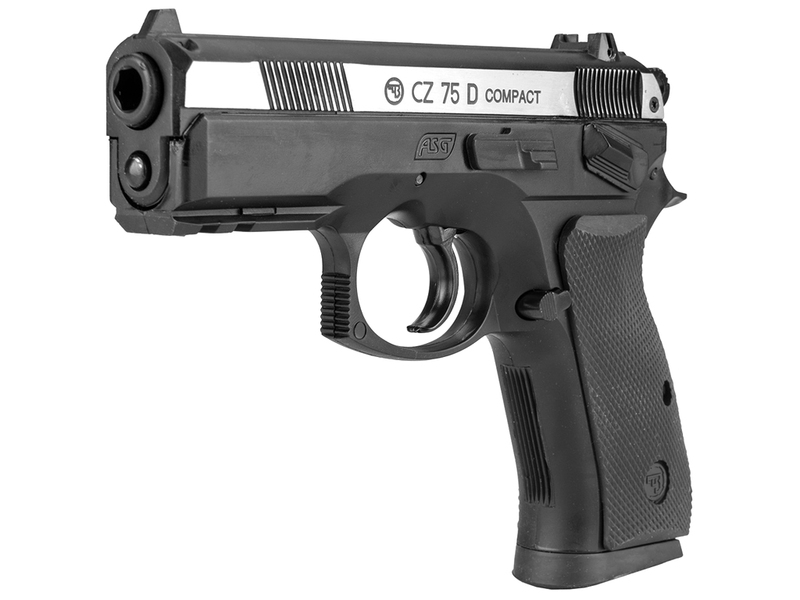 http://www.ReplicaAirguns.com - ASG CZ 75D Compact CO2 BB Pistol Table Top Review. 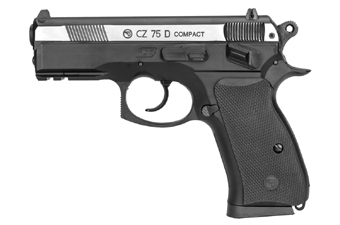 This video is a walkthrough review of the ASG CZ 75D Compact Non-blowback CO2 BB Gun. I show off this airgun close up from all angles and point out the metal and polymer components and the features and benefits of this air pistol. I also do a quick pre-test with my Chronograph to get an idea of the fps performance and also shoot this ASG BB pistol from 20 feet out on target for some accuracy readings. 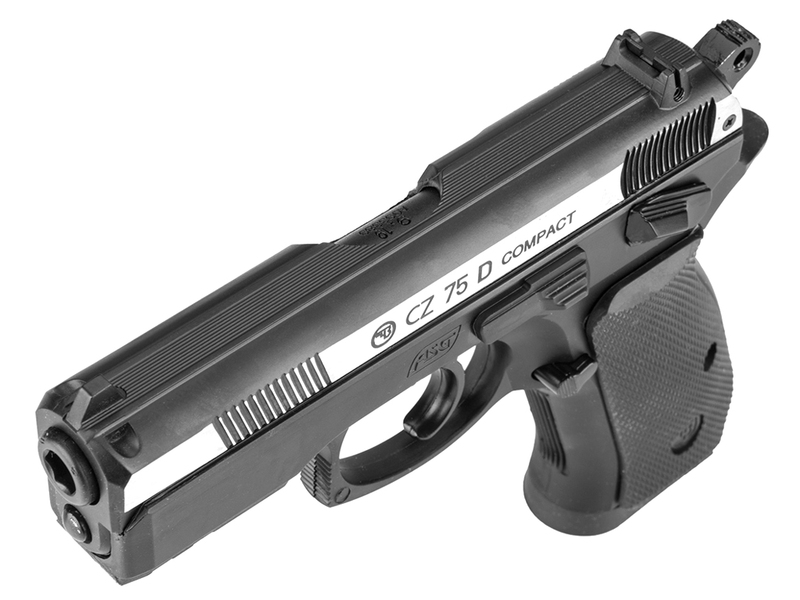 I am a bit of a blowback guy so I generally don't look as much forward to reviews of guns without blowback, It was however nice that the ASG CZ 75D Compact does have a moveable slide and it has the least amount of wobble out of any gun I have reviewed to date. 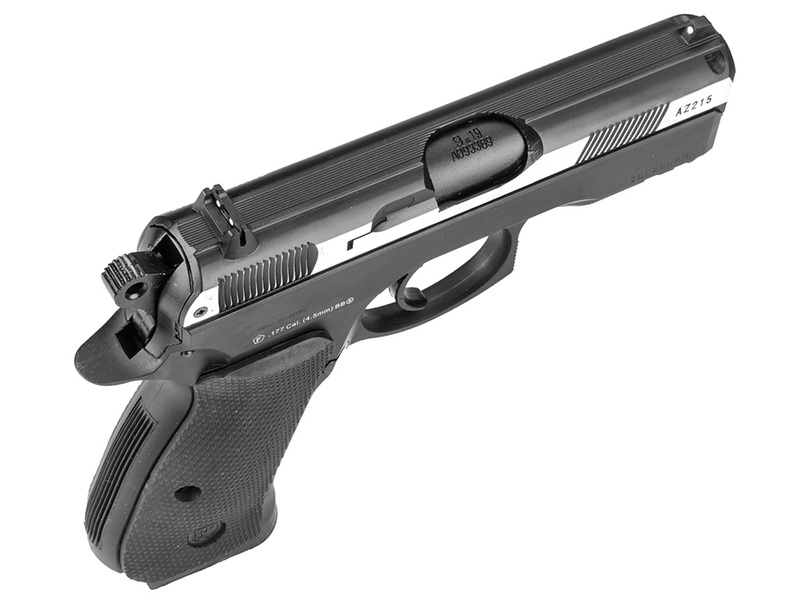 I was impressed withe the overall performance of this air pistol, nothing stands out but overall it is a nice complete package getting lots of shots per CO2, good fps, good accuracy, a single and double action trigger, adjustable sights, a rail for add ons, a full size drop out metal magazine and it's a rally good overall replica with full CZ licensing throughout. Not bad for a fairly low cost 45.mm CO2 BB pistol!